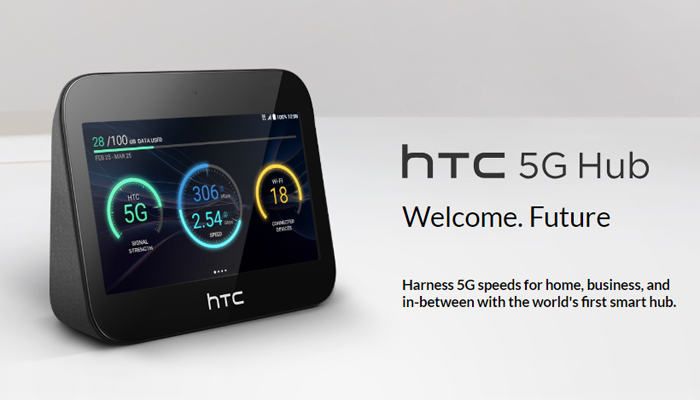 At the Mobile World Congress in Barcelona, HTC has presented a new 5G router, ​​not a new smartphone, which is out of our expectionb. The 5G router comes with Android user interface and is equipped with a huge screen. The 5G router chipset comes from Qualcomm. The HTC 5G Hub is equipped with a 5 inch touch screen on the front. The resolution is quite rough with 1280 x 720 pixels, but for a router such a huge screen is still almost oversized anyway. HTC promises that the 5G router is with Android 9 operating system, and can also stream movies. The output can also be made via the built-in USB-C port on the back of a TV, so you do not necessarily rely on the screen on the router. With the microSD card slot, you can also play your own content such as photos and videos on the 5G hub. The integrated modem comes from Qualcomm, it is the model Snapdragon X50v2. The processor uses a Snapdragon 855 with 4 GB of RAM. The internal memory of the 5G Hub is 32 GB, which is sufficient for the operating system and some apps. In addition to the USB Type C connector, there is also a RJ45 Gigabit LAN connector and a connector for a power supply. However, there is no connector for external antennas, so External antennas cannot be connected. Wi-Fi is supported on both 2.4GHz and 5GHz. In addition to the current WLAN ac standard, the upcoming WLAN ad / WLAN 6 standard is also supported. 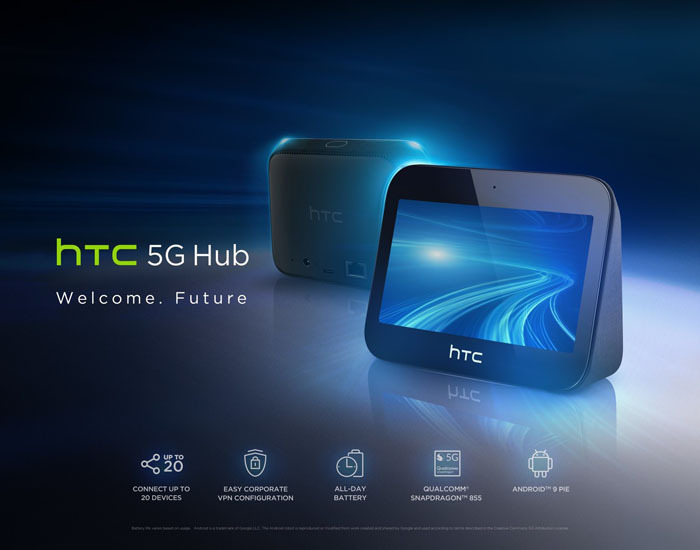 The HTC 5G Hub can use 5G both in the mmWave frequency range between 26 and 28 GHz and in the C-band frequency range between 3.4 and 3.8 GHz. The C-band, also known as band n78, will be available in Europe. Whether the HTC 5g router also supports older mobile radio standards such as LTE and UMTS, is so far unclear. Since with the Snapdragon 855 a suitable modem is installed, but can be assumed. 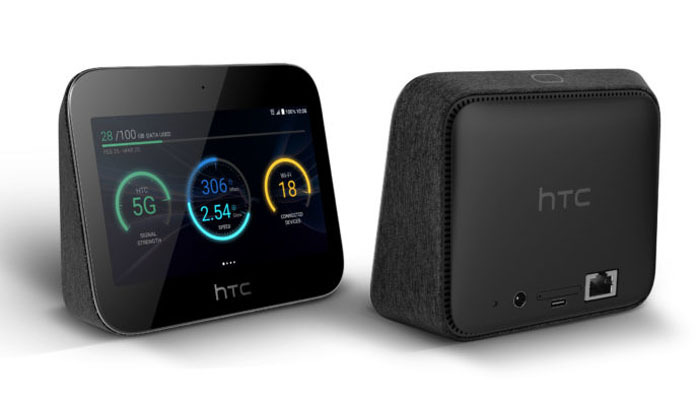 HTC brings the 5G Hub in cooperation with various network operators on the market, among other things, the 5G router is also offered in Germany at Telekom. When and at what price is still unknown. Other providers of the HTC 5G Hub are Elisa (Finland), Sunrise (Switzerland), Three (England), Telstra (Australia) and Sprint (USA). At Sprint, the 5G Hub will be available in the second quarter of 2019. Not only the first 5G smartphone and the first 5G router were presented at the Mobile World Congress (MWC) in Barcelona this year, but also the first mobile 5G router was also shown. Huawei, known for many years for mobile hotspots, has already introduced the second mobile 5G router after the world’s first one Netgear Nighthawk M2 5G mobile router. 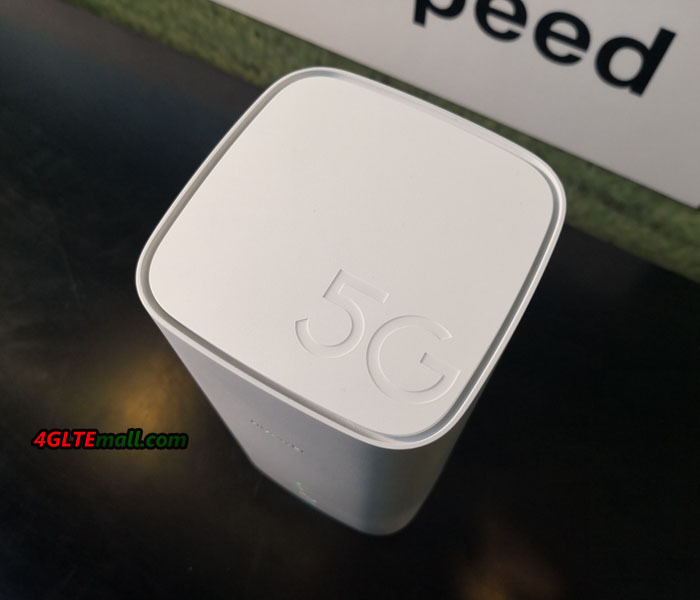 The “5G Mobile WiFi“, as Huawei calls its first mobile 5G hotspot, does not seem to have a model number yet, but visitors to the MWC can already view the device at the Huawei stand. 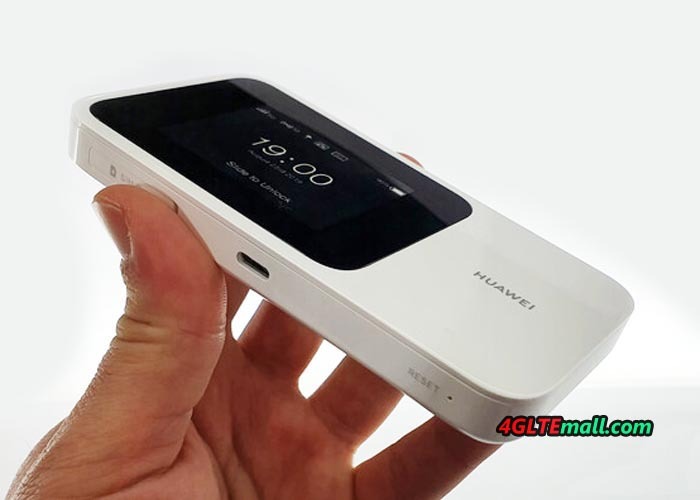 Visually, the model looks very similar to the predecessor 4G mobile hotspot Huawei E5788, but the 5G Mobile WiFi is significantly larger. This is probably due to the integrated 8,000 mAh strong battery – the battery of the E5788 is not as strong as even half. The battery is charged via USB Type C, it is also possible to connect to the computer. Optionally, the large battery is also suitable as a power bank, devices such as smartphones can even be charged via wireless charging with the Huawei 5G Mobile WiFi. The Huawei 5G Mobile WiFi is operated either via touch screen or via an app on the smartphone. As a 5G modem, a HiSilicon Balong 5000 chipset is used, an in-house development by Huawei. The Balong 5000 can also use 4G/LTE in addition to 5G. So the mobile hotspot is backwards compatible with older mobile networks, so that the connection does not break off when you change from the 5G radio cell into an LTE cell. 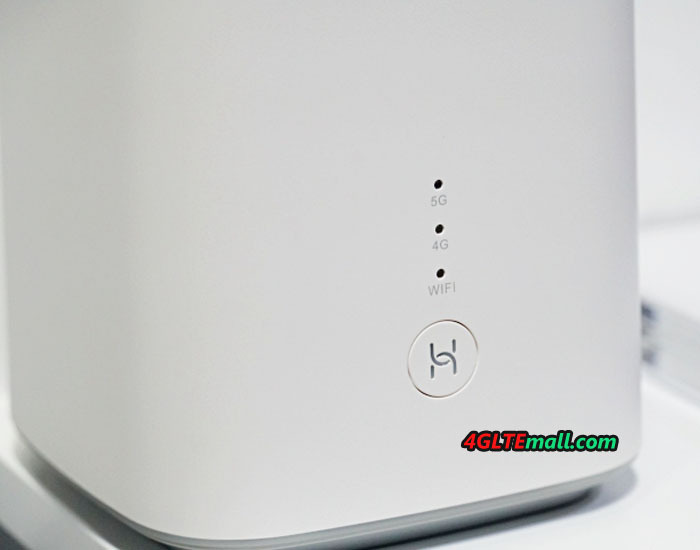 The Huawei 5G WiFi Router can use Wi-Fi at 2.4 and 5 gigahertz and supports not only the current WLAN 802.11ac standard (WLAN 5) but also the new WiFi 6 standard. How many devices can be supplied with Internet at the same time is not yet known. Huawei advertises that it is sufficient to scan a QR code to connect to the WLAN. If required, the QR code will be shown in the display of the device. Further technical specifications about the Huawei 5G Mobile WiFi are not yet available. Also information about the price and availability of the mobile 5G router are not yet known. The first 5G networks are expected to go into operation in mid-2019, and we suppose then the Huawei 5G mobile WiFi would be available to use. At the World Mobile Congress 2019 in Barcelona, ​​HUAWEI unveiled a number of new products, including the updated flagship laptop HUAWEI MateBook X Pro, new laptops of HUAWEI MateBook 13 and HUAWEI MateBook 14, folding 5G-smartphone HUAWEI Mate X, Huawei 5G mobile WiFi and Huawei 5G CPE Pro based on the first serial multi-mode chipset Balong 5000. At MWC 2018, HUAWEI unveiled the HUAWEI MateBook X Pro, the first laptop with a FullView screen. Today at the MWC 2019, HUAWEI presents the new improved HUAWEI MateBook X Pro. It has all the characteristics of the flagship: modern design, innovation and smart technology, high performance and versatile communications that raise the bar for the flagship laptop to a new height. HUAWEI MateBook X Pro is equipped with a 13.9-inch FullView screen with a resolution of 3K Ultra and a 91% ratio of screen area and laptop case. In addition, the touch layer with the recognition of 10 simultaneous touches and the world’s first technology screenshots finger gestures provide users with a new, intuitive way to interact with your computer. 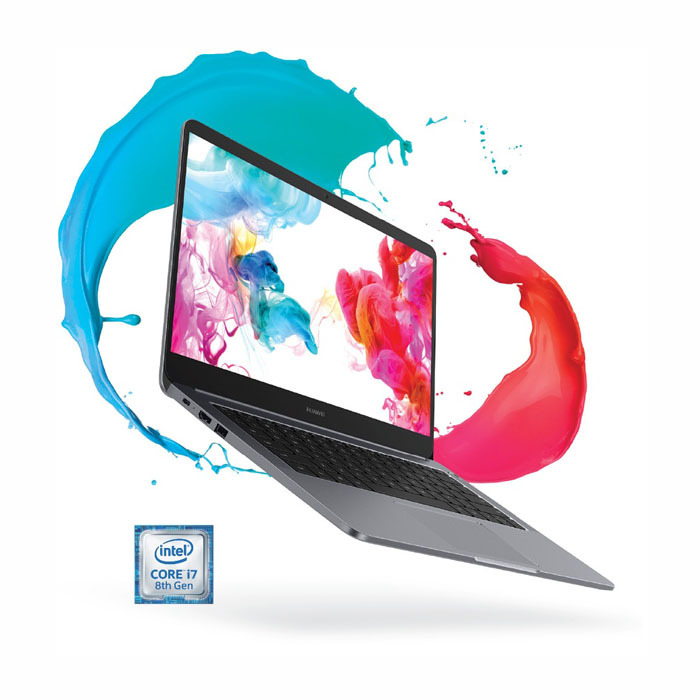 High performance HUAWEI MateBook X Pro is provided by an 8th generation Intel® Core ™ i7-8565 processor, a discrete NVIDIA® GeForce® MX250 GPU with 2 GB of GDDR5 memory. The laptop is also equipped with Wi-Fi and Bluetooth 5.0 wireless connectivity modules, Thunderbolt ™ 3 high-speed port and Dolby Atmos audio system with surround sound technology. Smart connections and cross-platform interactions between devices are the mainstream universal user experience. The new HUAWEI MateBook X Pro supports HUAWEI Share 3.0 technology with OneHop function, which not only provides a quick exchange of photos and videos between laptops and smartphones, but also recognizes characters in images, transforming them into text. Screen recording has become as simple as ever. It is enough to shake the smartphone, and on the computer screen print HUAWEI PC Share, so that the image from the laptop screen starts to be transmitted to the mobile device. HUAWEI has also developed the unique Clipboard Sharing feature that allows you to copy content on one device and paste it on another one nearby. Thus, both devices can work with one synchronized memory buffer. 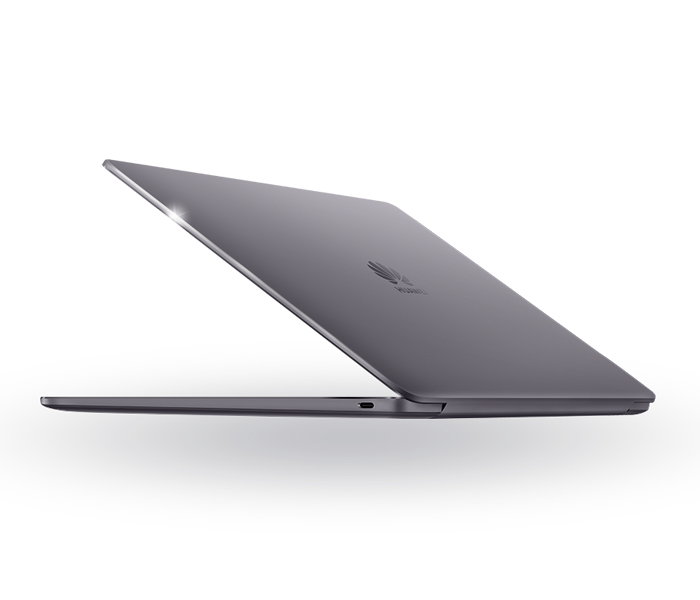 HUAWEI MateBook 13 and HUAWEI MateBook 14 laptops make advanced technologies accessible to middle-income users. They combine all the qualities of a new generation of products: FullView screens, high performance, mobility, high workmanship and modern design. The devices also offer users the latest smart communication tools between their computer and mobile devices. HUAWEI MateBook 14 has all the main features of the MateBook series: FullView screen, high workmanship, sophisticated design, and good performance. HUAWEI MateBook 13 and HUAWEI MateBook 14 are equipped with FullView screens with a convenient 3: 2 aspect ratio, thin frames and a touch layer that recognizes up to 10 simultaneous touches. Both laptops support new handy features, such as a screenshot with finger gestures that highlight the user’s personality. 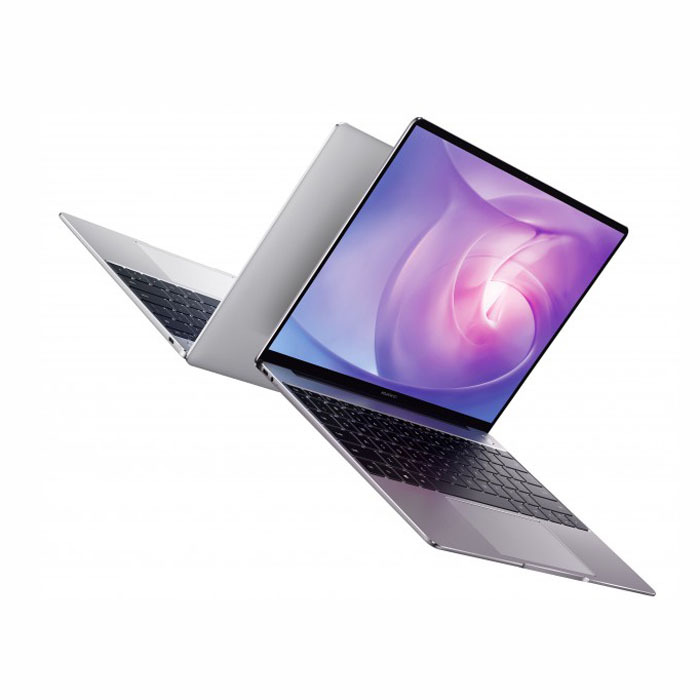 HUAWEI MateBook 14 is equipped with high-performance components: Intel® Core ™ i7-8565U 8th generation processor and a discrete NVIDIA® GeForce® MX250 video card, but it does not heat up due to an efficient cooling system with special design coolers. A battery with a capacity of 57.4 W * h and energy-saving software features HUAWEI provide long battery life. HUAWEI MateBook 13, in turn, is improving standards in screen, performance, and cross-platform connectivity among 13-inch mid-price laptops. It is also equipped with an 8th generation Intel® Core ™ i7-8565U processor, a NVIDIA® GeForce® MX150 GPU discrete graphics card, and a cooling system based on HUAWEI Shark Fin Fans 2.0 coolers, which, even under heavy loads, efficiently removes heat and still work silently. HUAWEI MateBook 13 is equipped with a FullView screen with a 3: 2 aspect ratio and a 88% screen-to-area ratio, and also with a touch layer that recognizes up to 10 simultaneous touches. To enhance the capabilities of HUAWEI computers, developers have proposed smart means of interacting with mobile devices: HUAWEI Share 3.0 technology, which, thanks to the OneHop and Clipboard Sharing features, provides smart, fast and simple, cross-platform interaction between laptops and smartphones. Other features include finger gestures screenshot, power button with integrated fingerprint scanner, Dolby Atmos ®technology. All of them are for those who need instant connection and universal interaction of all devices, including laptops and smartphones. Balong 5000 supports a range of 5G devices, including 5G smartphones, home broadband devices, car systems and 5G modules. Thus, it provides users with 5G communication in a variety of situations. The HUAWEI 5G CPE Pro Router, equipped with the Balong 5000 chipset, supports 4G and 5G connections and sets new standards for wireless modems. For example, a 1 GB video clip can be downloaded in just three seconds, and 8K video is broadcast continuously, without any delay. The HUAWEI 5G CPE Pro modem can be used for super-speed broadband access not only in homes, but also in the offices of companies. Using the new Wi-Fi 6 technology, the HUAWEI 5G CPE Pro modem provides data rates of up to 4.8 Gbps. In addition, it is the world’s smallest consumer telecommunications device (CPE) and the world’s first 5G CPE device that supports HUAWEI HiLink protocols and translates smart homes into a 5G era. In the coming 5G era, HUAWEI has the leading position and capabilities to implement its universal strategy. Now HUAWEI is the only manufacturer of the full range of 5G products, including chipsets, Edge-class networks and cloud services. Huawei intends to expand the capabilities of 5G communication in order to provide users with all the benefits of a truly universal “smart” life. What is WiFi 6 and How Fast is WiFi 6? Wi-Fi is getting stronger, faster data transfer speed. Internet connection speed is becoming faster and faster to meet user demand. Not only serving in the purpose of sharing common data, the Internet is now also used for other purposes such as entertainment, learning, etc… Users not only use the Internet via desktop computers as before, but also use other mobile devices such as laptops, smartphones, tablets. The next generation of Wi-Fi, known as Wi-Fi 6, has been upgraded to a lot of things, not just speed. The benefits of this technology will be evident over time. The upgrade includes features and speeds to ensure that the needs of users are not only present but also in the future. Simply speaking, WiFi 6 is the next generation Wi-Fi, which helps users connect to the Internet. Along with that is the series of additional technologies to increase efficiency and better connection speed. How fast is Wi-Fi 6? The Wi-Fi 6 standard will have a transmission speed of up to 9.6 Gbps in theory. The previous version, Wi-Fi 5, achieved a 3.5 Gbps connection speed in theory. It should be noted that the theoretical speed and actual speed are always different due to environmental factors. However, Wi-Fi 6 still gives users a line speed with an impressive number. Instead of upgrading the connection speed to devices, Wi-Fi 6 also improves the network connection performance that the devices connect through it. That is the main goal that this technology focuses on. By the time the Wi-Fi 5 network technology, an average US family used five Wi-Fi-connected devices. Currently the number has reached 9 devices. And according to technology company estimates, this number will be up to 50 devices within the next few years. The more devices connected on the same line, the slower the network speed will be. And the launch of Wi-Fi 6 comes with new technology that minimizes problems that occur when network connections have multiple devices connected at the same time. It helps router equipment (routers) can communicate with multiple devices at the same time, transmit data to multiple devices in the same broadcast domain and allow Wi-Fi devices to schedule to check router. These features will make the connection more stable while more and more devices require data transmission on the line. How fast will devices connect to Wi-Fi 6? This is a pretty difficult question to answer. A laptop that supports Wi-Fi 6 connected to a Wi-Fi 6-enabled router may only be faster in the same case as Wi-Fi 5. But the difference between them is not very different. Assessment can only be based on the number of devices connected to the router and the data transmission required on the network. If the current router device is likely to experience a hang, congestion resulting in reduced line quality, then the Wi-Fi 6-enabled router exhibits incredible stability. The current transmission speed is no longer an important factor in Wi-Fi connection. The key point now is the stability of a Wi-Fi network as well as Wi-Fi or router devices. Imagine in a multi-member family, some of whom are watching movies via Netflix, who are playing online games, others are calling video calls, along with a variety of other smarthome devices in Wi-Fi connection. Everything is still connected normally, there is no lag, congestion or disconnection. The maximum transmission speed of the devices is not really necessary to upgrade, but the normal speed of use of the user needs a significant upgrade. It depends on the number of Wi-Fi devices that users use, as well as the speed that these devices need to operate stably. How to get Wi-Fi 6? To be able to experience Wi-Fi 6, users need to buy new devices that support this technology. When shopping for a device that supports the latest wireless connectivity, this almost means you also have the latest Wi-Fi connection technology. And another important thing is that users need to buy themselves a router device that supports this technology. If there are a lot of devices that are connecting via Wi-Fi and transmission quality have declined in recent years, it’s time for users to consider buying themselves a router supporting Wi-Fi 6. There are two main technologies that make Wi-Fi 6 more powerful: MU-MIMO and OFDMA. MU-MIMO (multi-user, multiple input, multiple output) is now integrated on current router devices, but Wi-Fi 6 will have additional upgrades. This technology enables router devices to communicate with multiple devices at the same time, instead of just communicating with each device at a time. Currently, MU-MIMO allows the router to communicate with 4 devices at the same time, but for Wi-Fi 6 it will be 8 devices. And the other technology, orthogonal frequency division multiple access (OFDMA) allows one data transfer to multiple devices at the same time. Another technology that comes with Wi-Fi 6 allows the device to schedule a connection to the router, reduce transmission time and detect signals via antenna. This saves energy and battery life of the device more. “Target Wake Time” is the feature that helps Wi-Fi 6 can help devices communicate with the router at predetermined intervals. However, this feature is not really useful for devices that need to transmit data continuously. Instead, the feature of this new technology will help save energy for devices with low battery life like smarthome devices, just update the status according to the present time. For example, sensors inside smart devices are usually in the home, they only read the environmental data and send it to the server within the specified time period. Last year, Wi-Fi was integrated with a new security protocol, called WPA3. WPA3 makes it hard for hackers to crack passwords using library kits to predict passwords, and make data less useful if hackers steal it. Current devices support the WPA3 protocol, but this is only an option for users to choose. For Wi-Fi 6, WPA3 will be required, so devices that are compatible with Wi-Fi 6 will become more secure. Wi-Fi 6-enabled devices have appeared on the market but the number is still quite small. 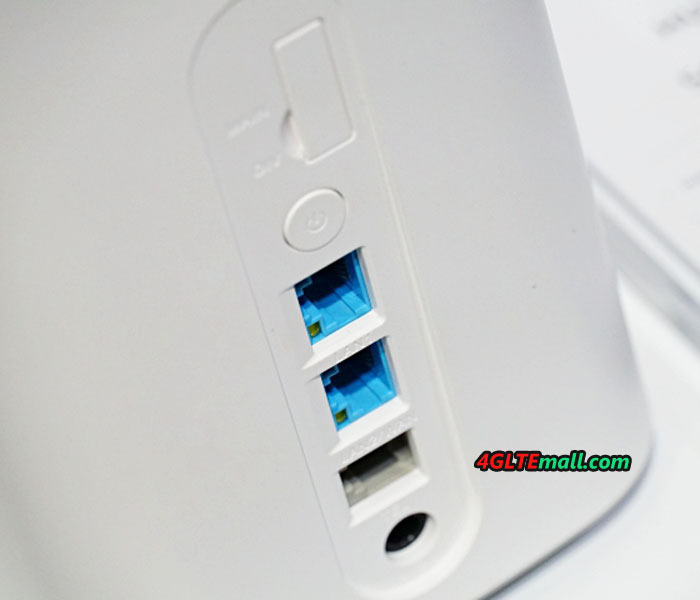 Wi-Fi 6-enabled router devices are also on the market but the price is very high. Laptops that support this new technology have also appeared in some parts of the market. Wi-Fi 6 is currently integrated on today’s high-end devices. Snapdragon 855 is a chip that will support this technology. Expected next year, Wi-Fi 6 will become widely available. Wi-Fi 6 is expected to become popular by 2020, making wireless networking more secure and stable. Posted on 2019-02-27 Categories 5G TechnologyTags How fast is WiFi 6, What is WiFi 6, WiFi 62 Comments on What is WiFi 6 and How Fast is WiFi 6? 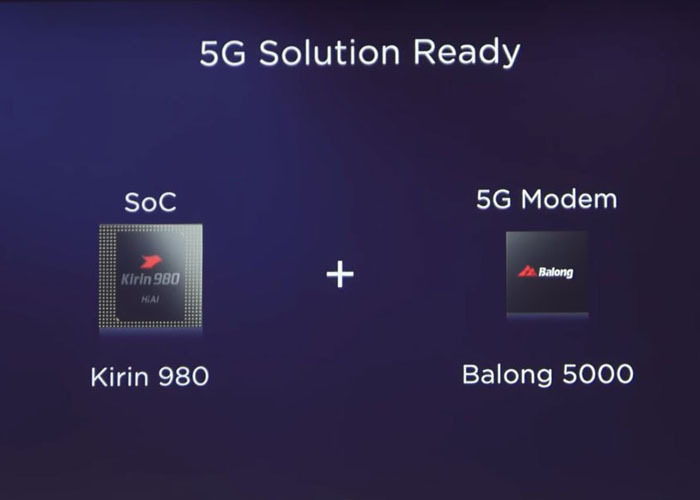 Huawei officially launched the multi-mode 5G chipset called Balong 5000 and was first used on the Huawei 5G CPE Pro router. The perfect combination of these two products will bring the world’s fastest wireless connection speed not only on smartphones but also for larger spaces like houses, offices and other large spaces. The Balong 5000 chipset is expected to help Huawei formally open the era for leading advanced 5G technology. In addition, the Balong 5000 chipset also provides optimal support on a range of other 5G products, such as home broadband network equipment, car-mounted devices and 5G modules. Thus, Balong 5000 will help consumers have the opportunity to experience 5G completely new in many different usage situations. With a compact design (SFF) and a high level of integration, Balong 5000 supports 2G, 3G, 4G and even 5G on a single chip. This will minimize the latency and power consumption when transferring data between different modes, and significantly improve the user experience in the early stages of 5G deployment. 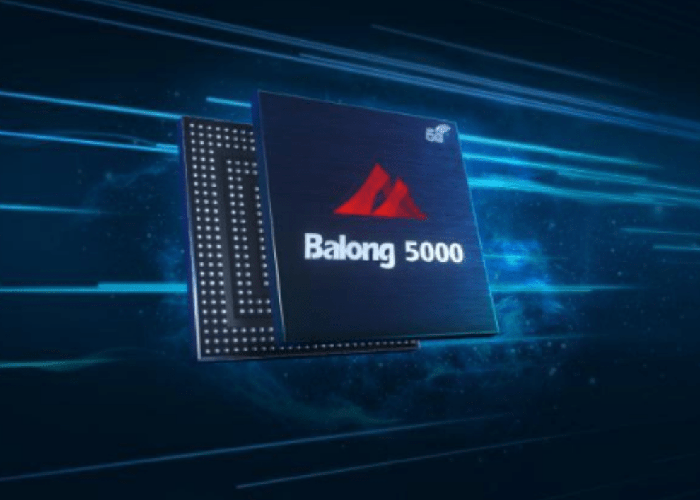 Balong 5000 marked a big step forward for the Balong chipset series. On the market, Balong 5000 is the first chip for download speed reaching 5G standard. In Sub-6 GHz band (low operating frequency, main frequency used for 5G), Balong 5000 can achieve download speeds up to 4.6 Gbps. In the mmWave spectrum band (high operating frequency, used for extended spectrum for 5G), Balong can achieve download speed of 6.5 Gbps – 10 times faster than the leading 4G LTE in the current market. Besides, Balong 5000 is also the first chip in the world to support both independent network architecture (SA) and non-independent (NSA). With a non-independent form, 5G network architecture is built on 4G LTE network platform. Meanwhile, the independent form, as the name suggests, will have its own architecture. 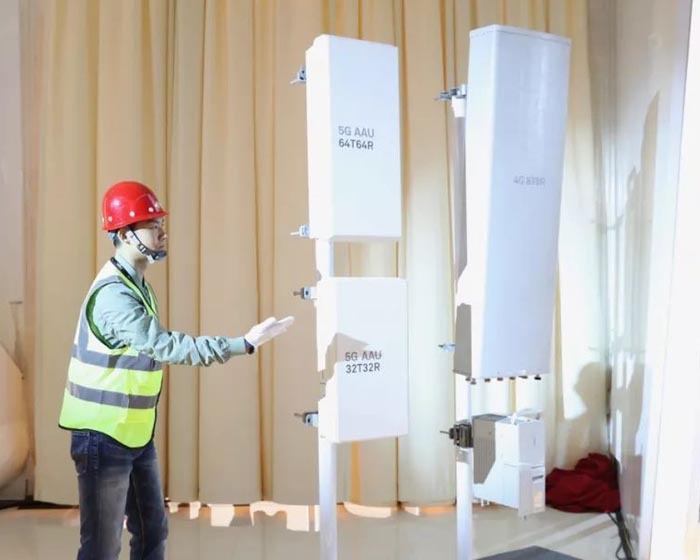 Balong 5000 can flexibly meet different requirements from users and operators in connecting equipment throughout the development stages of 5G. Moreover, Balong 5000 is also the world’s first multi-mode chip that supports the V2X protocol (universal connection method), providing a reliable and low-latency solution for connected media. Huawei’s 5G smartphones using Balong 5000 will be launched at the Global Mobile Exhibition (MWC) in Barcelona this year. Based on the Balong 5000, Huawei 5G CPE Pro router supports both 4G and 5G connections. With 5G network, a 1GB HD video clip can be downloaded in just 3 seconds. 8K format videos can also be played smoothly, without interruption. This set new standards for home CPE equipment. 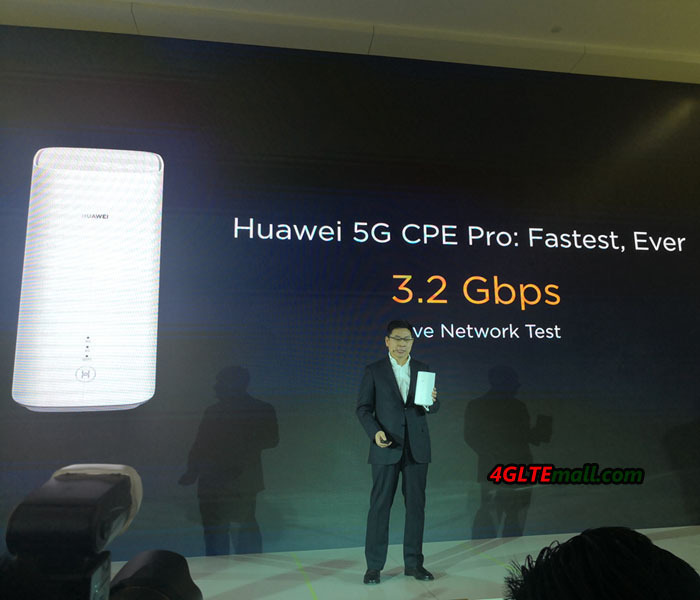 In addition, Huawei 5G CPE Pro can also be used for small and medium enterprises, with fast broadband Internet access speed. Applying new generation 6 Wi-Fi technology, Huawei 5G CPE Pro router can provides speeds up to 4.8 Gbps. This is the first 5G CPE to support Huawei HiLink protocol, bringing smart home ecosystem (smart home) into the 5G era. As a pioneer in 5G technology, Huawei has started to research and develop 5G since 2009, currently the only company on the market that can provide all devices for 5G networks. Huawei has more than 5,700 engineers working in the R&D department, including more than 500 network experts. In total, Huawei has established 11 creative cooperation centers for the 5G solution globally. It’s obvious that the Huawei Mate X is the main role at the Barcelona event MWC2019. With the Mate X, Huawei also presented some 5G gadgets such as Huawei 5G CPE Pro and Huawei 5G Mobile WiFi. Although they are not very spectacular, the useful line of innovations naturally attracts intentions at the event. 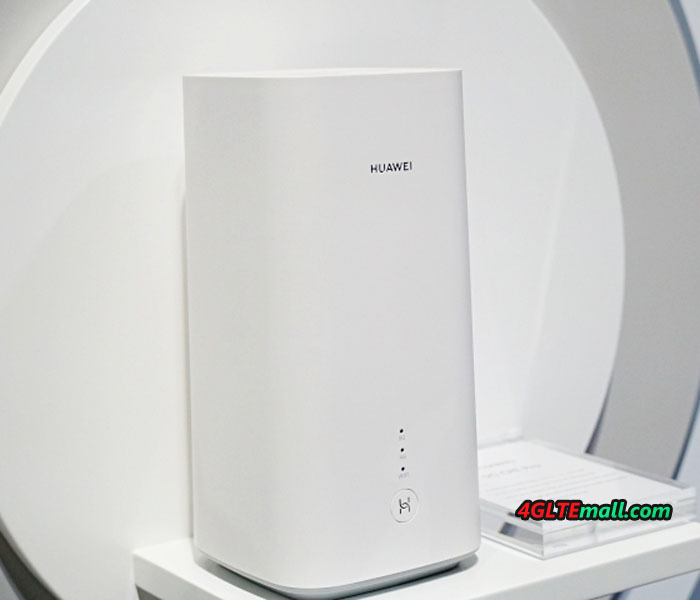 According to Huawei, the Huawei 5G Mobile Pocket Wi-Fi router has built a Balong 5000 chipset platform modem, the maximum data rate can reach 4.6 Gbit/s, which is very faster than current 4G speeds. The new 5G device supports sixth-generation Wi-Fi networks (ax), with the use of which the speed of data exchange within the network reaches 4.8 Gbit/s. Due to this, a file of 1 GB can be downloaded in just 3 seconds, that is, almost instantly. 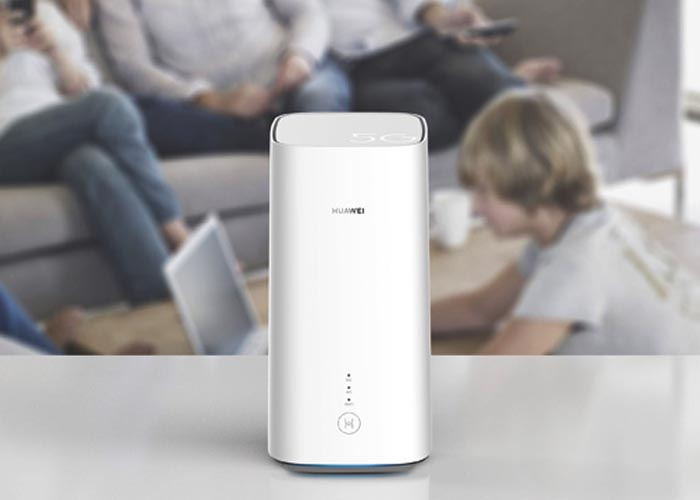 With the support of Wi-Fi 6 (ax) HiLink technology, owners of the new Huawei 5G portable WiFi router can communicate with multiple devices within the network any data as much as four times as fast as using Wi-Fi 5 (ac). 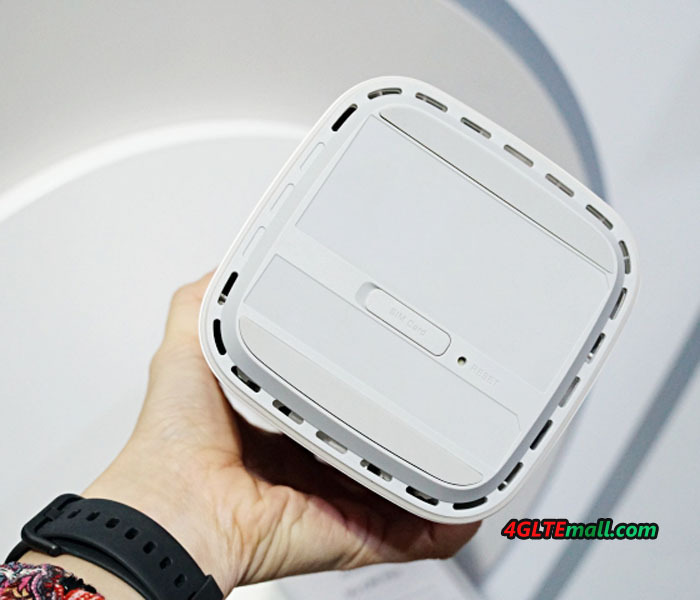 The Huawei 5G WiFi Hotspot router has a large battery pack of 8000 mAh, and it provides about 7 hours of operation in the 5G network at the highest speed. When using networks 3G and 4G LTE, this figure is increased by 2 – 3 times. 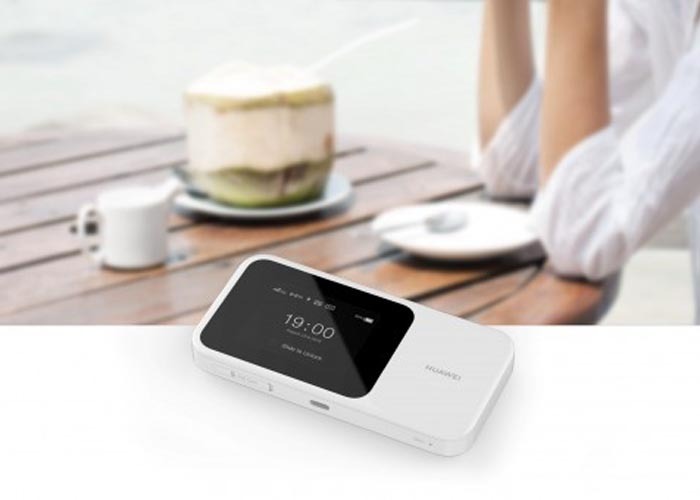 The Huawei 5G Mobile Wi-Fi Portable Router supports Qi’s fast charging technology and can also be used as a stationary access point – for this you need to connect the charger via a USB Type-C connector. 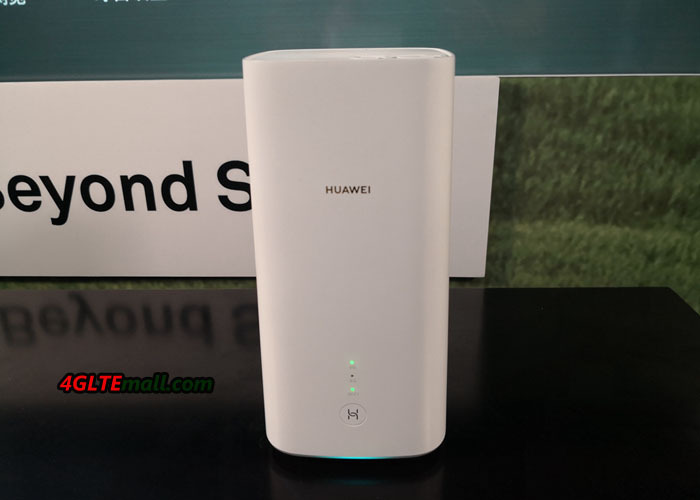 Also, the manufacturer would provide the antenna connectors in the Huawei 5G pocket WiFi and also introduced a touch screen that allows you to control routers with different capabilities without having to enter the “admin” via a third-party device. 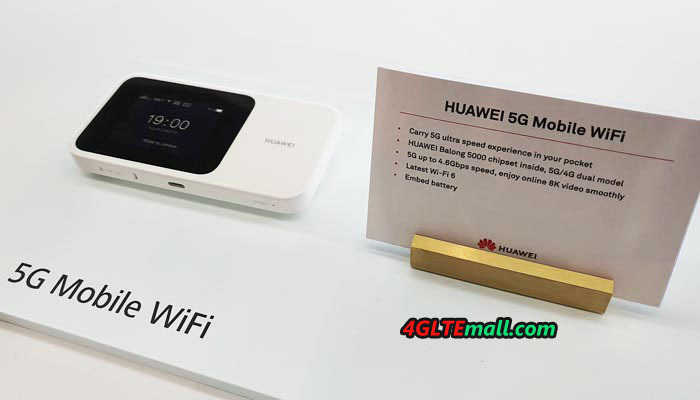 Since Huawei mobile WiFi hotspots are always popular in thousands of users worldwide, the latest Huawei 5G mobile WiFi router would be no doubt a selling star. However, Huawei didn’t tell when they would be available. We predect it would be available around June, 2019. And the price would not be cheap because the 5G network construction over the world is still on the way. But we would keep updating the news of this new 5G WiFi router. Network equipment supplier Huawei has already delivered more than 40,000 5G-enabled mobile base stations worldwide. This was announced by Ryan Ding, president of the Huawei Carrier Business Group, in the run-up to the Mobile World Congress. Given that the use of Huawei 5G technology is currently much discussed politically, this number is quite remarkable. Especially in Europe, the Chinese network equipment supplier is strong. Eighteen European mobile network operators have already selected Huawei as the supplier for their 5G network. Corresponding contracts have already been signed, according to Ryan Ding. As of February 2019, Huawei has completed around 30 such 5G equipment supplier contracts worldwide, so that the focus is clearly on Europe. Huawei has been delivering 5G base stations since September 2018, and within a few months 40,000 devices have already been sold to network operators. 5G base stations are usually also backwards compatible with older mobile technologies. Thus, they can be used, for example, for an LTE network expansion, a later upgrade to 5G is then easily possible. First commercial 5G mobile networks are expected in mid-2019. In the run-up to the Mobile World Congress 2019, Huawei has also shown new hardware for the 5G network expansion. Ryan Ding emphasizes that the 5G network technology is significantly smaller and lighter than the technology used in previous generations of mobile phones, such as LTE. Network operators can therefore install the technology with little effort and at low cost and quickly upgrade their networks to 5G. The 5G base stations should also be significantly more energy efficient so that no expansion of the power supply should be necessary to existing locations. 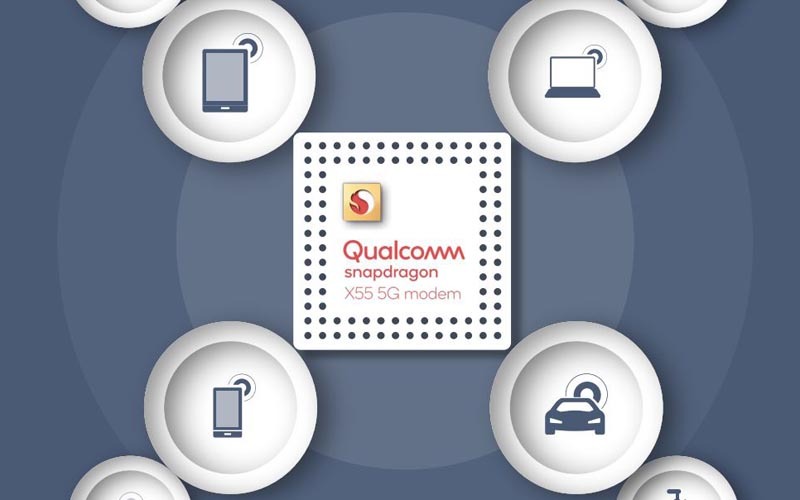 Yesteray, Qualcomm introduced the second generation of its 5G modem, the Snapdragon X55. The X55 modem can use 5G in a variety of frequency ranges and allows speeds of up to 7 gigabits per second. It supports both 5G standalone networks and 5G non-standalone networks. The Snapdragon X55 modem is also backwards compatible with LTE, UMTS and GSM (4G, 3G and 2G) in the initial phase of 5G. 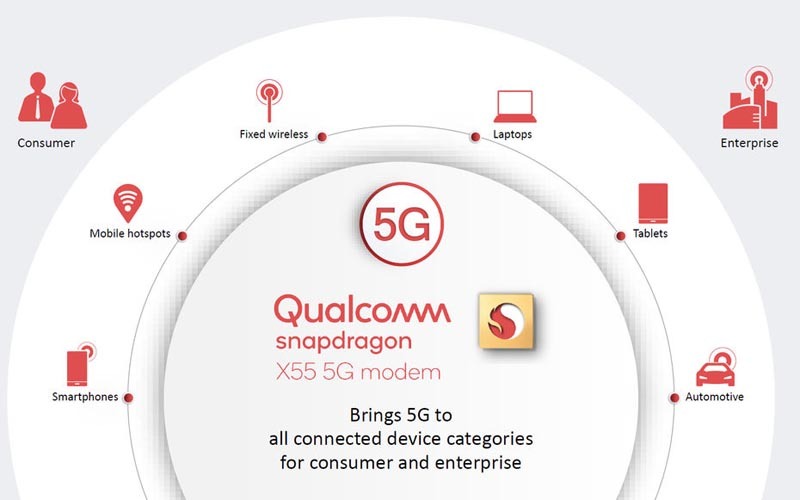 As the successor to X50, the Snapdragon X55 modem is already Qualcomm’s second 5G modem. The X55 modem is prepared for 4G / 5G spectrum sharing, allowing network operators to easily switch from LTE to 5G. The supported frequency ranges range from the millimeter-wave range (above 26 GHz) to the frequency range below 6 GHz. The range between 3.4 and 3.8 GHz used in Germany and Europe to launch 5G is also supported by the Qualcomm Snapdragon X55. The Qualcomm Snapdragon X55 modem is also up to date in the LTE network. With LTE Cat22, up to 2.5 Gbps can be used in the fourth-generation mobile network. The prerequisite for such high speeds is of course that the network operator uses sufficient spectrum and bundles this via carrier aggregation. Even the highest possible modulation and the use of 4 × 4 MIMO significantly increases the speed. 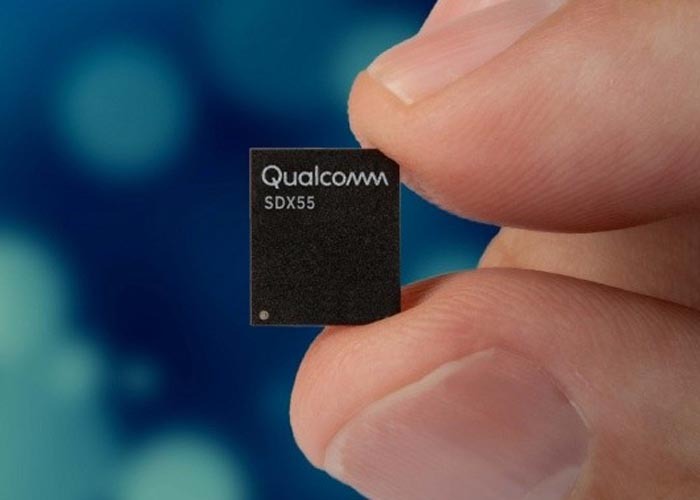 First commercial handsets with the new Snapdragon X55 5G modem will hit the market in late 2019, according to Qualcomm. For the first generation of 5G smartphones, which will probably appear in mid-2019, the modem comes a little too late. It might still be worthwhile to wait a bit and not to access the very first 5G smartphones, because the first generation of new mobile modems is experience quite energy hungry and quickly outdated.